Serbian teachers studying in Yad Vashem receive full accreditation for participation in seminars. Yad Vashem on Monday signed a Memorandum of Understanding (MOU) with the Serbian Ministry of Education codifying the working relationship between Yad Vashem and the Serbian government. Yad Vashem is the World Holocaust Remembrance Center. The agreement was signed in the presence of Assistant Education Minister Dr. Aleksandar Pajic, Serbian educators participating in a seminar at Yad Vashem's International School for Holocaust Studies. 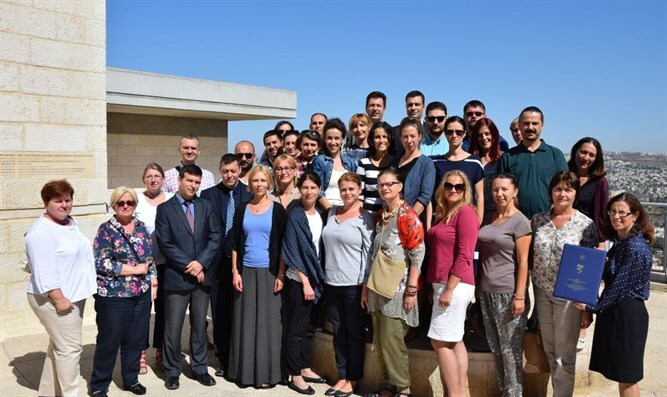 Over the years, Serbian teachers have participated in some of the hundreds of annual international workshops and educational seminars Yad Vashem has conducted for teachers and community leaders from all over the world. "Our pedagogical approach is respected as one of the best methodologies to deal with this most sensitive topic," said Holocaust Studies Chair Lily Safra Chair for Holocaust Studies and Yad Vashem International School for Holocaust Studies Director Dr. Eyal Kaminka. "We have governmental partnerships with more than 50 countries around the world and are thrilled to officially add Serbia to this prestigious group." Prior to this agreement, those educators from Serbia who participated in seminars at Yad Vashem did so in an unofficial capacity. Now, Serbian teachers will receive full accreditation for their participation and the number of seminars offered to them is set to increase. In April, Serbian Holocaust survivors in 27 countries were approved for additional aid.